IIRC, Infernos are supposed to be rare & only the most debased of units would use them. Not sure where you got that. This is a universe where flamers are a thing and a mech was built around them. Don't know why infernos would be an issue, other than the mech carrying them bursting into flames. Pretty sure some sources do indeed describe infernos as rare in usage at least. Looking at Sarna's article on infernos, which seems to be based on TM and TO, infantry supposedly use infernos often due to their effectiveness against 'Mechs, while 'Mechs rarely mount infernos because they're hazardous to MechWarriors (presumably due to their lower heat-induced ammo explosion point). Under the old BMR Rules, the Gargoyle Prime was hell on combat vehicles. all those pellets, all those missile hits, they were great for shaking apart a vehicle by crits, without even needing to breach the vee. TW era rules are less kind to it, but with the right optional rules, it has a niche again. the Called Shot rules work great with it, not aimed shot, called shot. This slightly increases the difficulty to hit, but lets you roll on the punch table (or leg table or a side table) giving you a 1 in 6 chance of doming them. a few turns sustained buckshot and missiles, and you can rack up enough cockpit hits, to put the other mechwarrior to bed without even breaching the head armor. The Gargoyle's Quirks as provided by the BMM help too. Stabilized arms let you run around without spoiling your murder shot. Works even better with some of the SPAs available. I suspect Ulric, with the bonuses that "Blood Stalker" gives you, may have ended the ghost bear khans in this fashion. I forgot about the old partial cover rules too, the +3 to hit is tough to get around (-2 after the pellet bonus) but the pellets each getting 1in 6 to hit the head would scramble a lot of pilots. With a 0 or 1 gunnery that might be a rare time where you move in such a way to put your opponent into partial cover lol. Old 3025 novels fluff IIRC. Maybe a mention in MW1 or BMR about inferno rules. But pretty sure they were semi frowned upon & only broken out in the most dire of circumstances or by barbarians, etc etc. Its actually in 3050 novels too . . . one of the POV characters on Nashur who commands a light hovertank lance is horrified to learn one of his subordinates loaded infernoes. He had been blaming Sunny's forces for bringing them to the fight and burning down the village. So it seems that it is a problem with collateral damage, not with smashing the enemy. Sorry, do not mean to derail the thread so this will be my last fire related post. Fire is fire. Does not matter if it is started with a flamer or inferno. I was under the impression that the reason they were disliked was because, in universe they were more volatile than standard SRMs. In game this was reflected in the additional heat related avoid ammo explosion rolls inferno ammo needed. -They were dedicated anti-mech weapons (no effect on anything else). They have always been murder on tanks. There wasn't much point in using them on infantry because everything murdered infantry under the old rules. The general prohibition against using infernos on tanks was always A) they're volatile and much more prone to exploding than standard SRMs ad B) they indiscriminately start fires everywhere- if you're not trying to destroy the area, it's counterproductive. 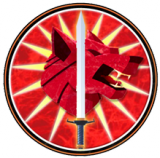 I started reading some of the really old Battletech novels a little while ago, ones I’d never bothered to read before. Decision at Thunder Rift mentions that infernos are a commonly used infantry weapon, if you’ve got somebody crazy enough to get close enough to use them (apparently they are supposed to have a shorter range than regular SRMs in that novel), but mechs don’t normally carry them because they are so volatile. I always play with floating criticals. When facing 3025 IS 'Mechs with torso bomb ammunition bins, the Gargoyle Prime can be quite scary to deal with. Combine that with a higher-than-average frequency of head hits and some infernos to turn the screws on opponents who already have marginal heat management, and it can hold its own as a niche unit. I've seen more than one overconfident Marauder go kerblooey when struck by a lucky LB5X salvo. Just wanted to say that I got to experience this first hand. In a recent game, my Mauler's pilot got knocked unconscious after four head hits from a Uller Prime. Armor was depleted, but no internal damage. In fact, the only location that took a real beating was the right leg; the rest of the locations were at over 50% armor. So it is not just hypothesis. I'm pretty sure that invoking obscure rules like the original Solaris Box Set rules is a concession that the Man O' War Prime is not good. Actually those rules came out not long after TRO 3050 did and they received a supplement in The Reaches. They also had 'Mechs in the boxed set designed specifically to use them (Juggernaut, Paladin, Onslaught, etc. ), along with similar 'Mechs in The Reaches (Sasquatch, Werewolf, etc.) and they were assumed to be used in Unbound too. There was a fair bit of support for them for a while. 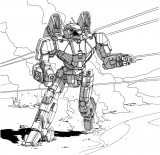 In one of the MoTW threads on the 3055 'Mechs, someone referenced a designer saying that the Vixen, Goshawk, and Viper were specifically designed to operate under those rules, hence the MG spam, etc. That's a lot of 'Mechs designed under that ruleset, so it's not farfetched to think that the dueling rules may have been somewhere in development when the Gargoyle Prime was invented. 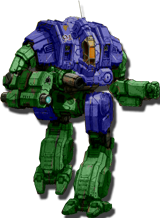 Plus, they were altered and incorporated into the MechWarrior's Guide to Solaris, so they continued for a bit after it was invented too. The Man O'War/Gargoyle Prime is indeed a beast under those rulesets, compounded by the ability in those rules for it to aim for the punch table and just let cluster shots do the work. 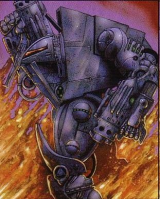 Then we get to the old Battletech Compendium rules where a Garg Prime could conceivably take on an entire armored company by itself (even without infernos since you couldn't use them in 6 packs back then), and could take Inferno hits for days while doing it. Infantry, including Elementals would be in a bad way too because there were no rules for reducing damage of big weapons to standard infantry and LBX Cluster shot negated Battle Armor dispersion rules. As a note, Elementals and standard Infantry frequently used Flamers and Infernos at the time (one Elemental even used Infernos in a Bloodname duel in the Blood of Kerensky trilogy), so that could have been a reason that the oversinking was tolerated too.There were no limits on heat addition back then, and though Infernos added only turns to duration per missile, not extra heat, Flamers could do what they liked. Not to mention that many cluster weapons combined with oversinking would have been good in a duel against an Aerospace Pilot known to use Inferno Bombs....which were pretty OP under Battletech Compendium. Was the effect of the Prime's full loadout intentional? 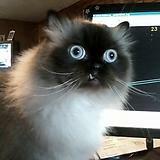 Dunno. There's some evidence to suggest it could have been, of course TRO 3050 was a trainwreck of bad rules, so who knows. Yes, it's bad in some situations, but there is some interesting history surrounding it. Can the Gargoyle Prime at least be explained in some in-universe or game design context? Sure. One bonus explanation: Maybe the Wolves expected the IS to pull no punches and break out the nukes. Nukes do happen to add lots of heat to 'Mechs at the edge of the blast. The Hoplite, which was designed during an era of nuclear warfare, is suspiciously oversinked as well. It doesn't really matter how quickly after the release of the Man O War the Solaris rules came out. They're still something that was only ever optional rules and I feel pretty comfortable saying that I don't believe that there was ever a point when they would have been used for a majority of games being played. If the argument rests on invoking special rules, it's conceding the point that under normal rules the mech just wasn't that good. I'd take it in a campaign. It's cheap, and the basic frame isn't bad. I'd play it a couple games (To avoid charges of cheese) and then change it to a real configuration. For a clan assault the garg prime is crap. For 1500 BPV it's not great, but I can think of things I'd consider worse. Battle Cobra F (Medium lasers good, UAC5 garbage) or Nova C (Needs more gauss ammo, equally inefficient use of heat capacity) are only a little cheaper, and neither carry as much armour. Here is a list of options from the MUL within 50 above to 100 below of the Gargoyle-Prime. I don't see a lot there that can take it out easily, and I don't see a lot there that adds as much pain v/s a combined arms force like a FC RCT. Don't get me wrong, there are mechs I'd rather field in there for certain situations but I mean, come on, some of those are Clan Lights or IS Mediums & they are not going to do well against an 80 ton near max armored beast that can hit you with 12 SRMs & then Kick you afterwards. Bigger mechs like the Goliath & Cyclops are slower, shorter on ammo/armor, or have juicy XLs or un-cased ammo just asking for a crit seeker like the Gargoyle to exploit. I think GC has an idea for a campaign use, but for me the real use for is as a team player. If some other mech opens up a couple holes, say with Clan ERPPCs, then this thing really starts to shine. RE inferno's, I thought the Clan's didn't use them in the opening stages of REVIVAL because Verrrrrrrry dishonourable! The Prime is taking mechs like the Dragon, Charger, and Lancelot a step further. They are not designed to match the typical speed and firepower of their weight class. The design goes in the opposite direction by focusing upon speed. That much armor and structure going 5/8 is pretty significant. Within the I.S. the design should not have any real issues, at least when it comes to the guiding principals of the organization fielding it. In clan society, and I am no clan society specialist so feel free to jump in if you are and I am off, but the mech should not be designed to operate as a team member. If it did then it would be similar to the Naga, or the prime config would at least be designated as something else. It appears that the prime would be designed for those looking to pick apart a slower target at range. The design has no means of overheating, which reduces the mental processing requirements of the design. The clusters could be used to connect when they might have a difficult shot. I think the design would make more sense in an MWO game then on the tabletop for most people. Specifically in the arena matches where individual speed could make a far greater difference then in a match with a group. If you are difficult to track and hit then a much slower assault mech is going to have a problem. Your problem is connecting with your shots due to the ammunition limitation. Regarding the OP's question about trying to disable a target through early crits, I would have to say that it is very possible. In a society in which dueling is a means of promotion, of answering debates, and warfare, knowing the opposing design's weaknesses is key. Knowing what area of a particular mech to shoot at for maximum effect is one thing, knowing that an area has several weakpoints where tossing a lot of pellets at it could allow you to hit them is a big difference. This wouldn't translate well into the tabletop, nor MWO. However, in a realistic environment where walking tanks have joints and other weak points it does seem that the Prime would be a Surgeon's scalpel instead of a wrecking ball trying to win via blunt force. Going back to the game, I have used Ac2s and LBX cannons to cause serious early game damage to a target. I haven't met a Stalker that I have not destroyed the gyro, double tapped the engine, or smashed the hip with small munitions in the first turn of fire. By the second or third turn I have critted at least one unit if a Stalker is not present. If one is then the Stalker is either flopping around or hiding waiting for others to engage before trying to move up again, while another unit is hit with a crit. I don't get great dice rolls, nor do I rely upon crits to carry me to victory. You have about the same odds at winning at roulette with a single number as you are rolling a through armor critical. It happens, the chances aren't great at 2.8%, the follow up roll to determine if you actual crit something is pretty decent, about the same as picking "red" or "black" in roulette. If you land at least 1 crit early on you are disabling some of the potential of the unit. Popping a small laser isn't much, but if you can reduce their mobility, destroy a main weapon, or detonate some ammo you won pretty big. That could cement your ability to dictate the fight. However, one does have to ask why it is the Prime variant if the design is so over sinked for it. If I had to come up with an in universe reason for it, I'd suggest that the variant ends up being used a lot because of how common the FedCom RCTs were. Basically the Clans started running into vehicles a lot more than they were used to. So what would have been a dueling configuration gets pressed into service as an anti-air and anti-vehicle platform. Basically it's a Warrior H-7 killer. As for why it's oversinked, that's because they filled up the engine with them. It was probably originally intended for the A variant to be the most common, but you never know exactly how equipment is going to be used once it hits the field. Yeah, the A, C or D work better with the DHS load. Sure I would take it, especially in a post Jihad/Dark Age environment. The dual SRM-6s allow for a multitude of specialized ammo ranging from tandem charge to Follow the Leader guided ammo, the LB-5s have a decent scattershot effect on things not equipped with Ferro Lamellor, and you can shift to regular slug to hit and engage at long range. The Prime is designed to be a machine that wears down its foes using pinpricks and scatter damage, using its speed to engage and disengage as needed. It's a unit requiring patience. If you want the insta-kill/high fire power version, use the A or the one with the ER Mediums and the AC-20. It's also a design that does well as an anti combined arms unit. Follow-The-Leader warheads are exclusive to LRMs and are IS only. It's been a bit since I looked at Tactical and Strategic Operations for munitions rules. However, the point still stands the SRM-6s offer a nice adjunct to the LB-5 rounds with a variety of ammunition types, and the Gargoyle Prime is useful in a number of roles in any era. There was never an argument that the Man O War Prime wasn't useful. Re infernos, I assume that during the opening stages of REVIVAL the Clans wouldn't use them at all. Unless they were going bandit hunting. Where do we get any sort of character POV saying infernoes are dishonorable? they they have a cultural stigma like they do in the IS?